About Us UK Thermography have specialised in Infrared Thermal Imaging services since the year 2000. Over the years our experience has also covered many industry sectors including electromechanical, product development, energy savings, veterinary and medical applications, marine and many more. Our work is driven by a passion to provide our clients with a friendly reliable service giving accurate results. With our vast experience and knowledge base, combined with using only the best professional equipment available on the market, we guarantee to provide a cost effective service and quality reporting standard that you can trust and rely on. Thermographic Surveys and Thermal Imaging Services. As part of routine maintenance electrical Thermal imaging is an indispensable tool to find faults before visible damage or fire occurs. Many components appear visually ok on initial inspection and can also function test ok however, some faults are only discovered when it is too late, or catastrophic failure occurs. This can lead to costly down time, equipment damage or worse still fire. Periodic electrical thermographic surveys can help reduce expensive down time and unexpected component failure. Although this service is not a replacement for regular planned maintenance, many electrical components are non user serviceable and give no or little warning when they are about to fail. Most faults are discovered when differential or abnormally high temperatures are present, but how hot is a fault? What's good heat and bad heat? That's where we come in! Over 20 years working with electrical equipment and 13 of those specialising in electrical thermography gives us on the spot knowledge of what's good and bad heat. Our Thermographic Surveys and comprehensive reporting format give you accurate and concise information on what's at fault and the best remedial course to take to correct it. With our infrared cameras we survey your equipment, where possible, starting from 11kv supply and transformers (where site owned or access is available) then progress down to switch rooms, distribution and localised control equipment on production lines. We don't just scratch the surface we cover everything that is accessible and suitable for monitoring. Historical data is retained for each item of equipment monitored and where necessary graphs created for SPC data. 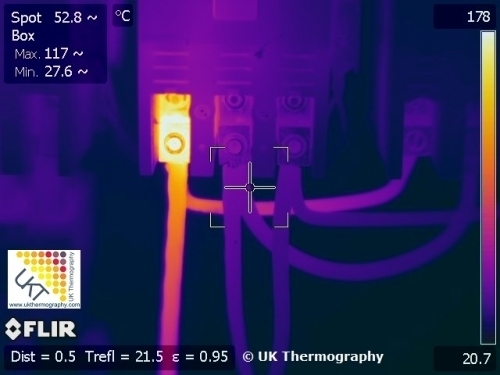 Electrical Thermal Surveys Periodic predictive maintenance by means of electrical thermographic surveys can help save time fault finding and unexpected down time due to component failure. 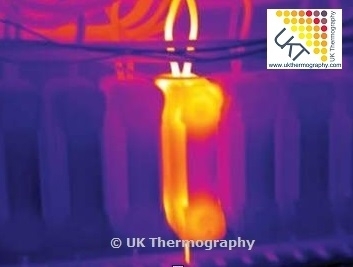 Thermography is non contact so equipment can be safely monitored whilst live and also equipment such as HV ceramic insulators and exposed pole switch terminals checked for degradation. Power generation Thermal Surveys Monitor degradation of insulation and heating systems. Insulation defects on industrial boilers can be costly and reduce heating efficiency. 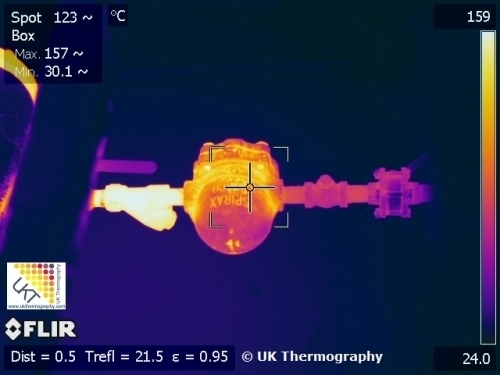 Pulverised fuel is highly abrasive and cause pipework to fail, Thermal imaging can help see where pipe and duct linings are damaged enabling you to target specific areas for refurbishment. 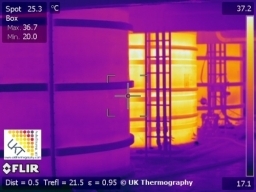 Fuel storage can be a potential fire hazard when stored in large quantities, Infrared imaging can monitor areas storage mounds for temperature rise and give early warning. Product Development Thermal Imaging Services Every product starts its life in development. these are usually tested for thermal and environmental effectiveness and limitations. Equipment efficiency, product temperature monitoring, and heat insulation, conduction and radiation are just a few of these that can be monitored using infrared thermography. Other examples are clothing development, safety ergonomics from safety equipment to leisurewear. Plastic extrusion and vacuum moulding can be monitored to ensure temperatures are equal across surface areas ensuring consistent product reproduction. The list is endless. 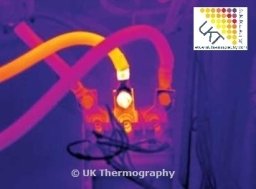 Infrared Electrical Thermal Survey Training - We have vast experience in many applications and specialise in electrical Thermal Imaging this gives us an opportunity to share this practical knowledge through our thermal imaging training course. With our hands on approach we offer practical, on site thermal imaging training for maintenance teams involved in predictive and preventative maintenance, or individuals wanting to gain an understanding and technique of the surveying and reporting process involved in thermal imaging. If you're looking to offer thermal imaging services these courses are a must to get a head start in the field and equip you with the knowledge to fault find effectively. If you would like to arrange training on your site please contact us to discuss your requirements and get a quote for this service. Veterinary Thermology Non contact indication of sprains and injuries in mammals; equine, feline and canine is sometimes required for both safety and welfare reasons. Infrared imaging can see inflammation and blood flow to areas in question form a safe distance with little impact on livestock, other than the presence of the thermographer, giving indication of underlying problems and injury healing. Tank Sediment Monitoring - Thermography can help Identify sediment within fluid or powder storage vestals reducing costly internal inspections and storage efficiency. All storage tanks can build up sediment over time, how much depends on the process and products being stored. Sediment can cause inaccurate readings of tank levels and also degradation that can only be seen when a vessel breach is apparent. Refractory Thermal Surveys Degradation of refractory linings, insulation properties, kiln coating fractures and efficiency are just a few examples where thermographic imaging can give clear indication and detect faults early. This can help plan downtime for refurbishment and repairs making your plant more efficient. Domestic Home Insulation Thermal Surveys All houses suffer from heat loss in one form or another. Depending how efficient the insulation is can save hundreds even thousands of pounds in some cases over the year in lost energy. This is not only a financial cost it has an Environmental impact. Heat loss through construction materials, roofing, air leaks on window frames, doors etc can be identified and measures put in place to reduce thermal loss. Heating systems over time can develop sediment in radiators, tanks and pipework. Thermal cameras can be used to checks for this and highlight where maintenance and servicing is required. Additional services include rising damp detection, masonry decay, vermin detection, structural degradation, location of cavities and braces. Building Water Ingress Thermal Surveys - Flat roof's commonly suffer from water ingress. These can sometimes be difficult to locate due to water tracking causing an internal leak several meters away from the source. Periodic thermographic inspections can hep identify areas of concern before water barriers fail and show internally allowing small repairs to be carried out rather than full coating replacement. insulation degradation, construction material water retention, and rising damp can also be seen clearly with the use of thermal cameras. Areas of moisture trapped in roofing layers can be seen and traced with our thermal imaging services and high end infrared cameras. Mechanical Ultrasonic Condition Monitoring Equipment operating at speed naturally degrades, how quickly depends on the level of maintenance and servicing the equipment is subject to and if it is being maintained correctly. Even equipment such as bearings that are lubricated on a regular basis can fail if it is not done correctly, such as over or under greasing, incorrect lubrication type etc. Many sites struggle to conducted regular planned maintenance on equipment and the engineering team have been cut back so 'Reactive Maintenance' is often the norm instead of 'Planned Maintenance'. When things start to fail it is sometimes too late to plan downtime and this can lead to a costly breakdown, production loss and even fire. Using a combination of Ultrasonic Monitoring and Thermal Imaging equipment, in line with regular maintenance can pick up faults long before they become problematic. Ultrasonic Condition monitoring is a cost effective method of detecting degradation long before failure occurs, giving you the opportunity to obtain the relevant parts, plan downtime and monitor the equipment closely before the repair is carried out. HV, MV Corona Testing Surveys HV, MV & LV Fault Detection Corona Discharge Coronas can generate audible and radio-frequency noise, particularly near electric power transmission lines. They also represent a power loss, and their action on atmospheric particulates, along with associated ozone and NOx production, can also be disadvantageous to human health where power lines run through built-up areas. Therefore, power transmission equipment is designed to minimise the formation of corona discharge. Faults in electrical components such as transformers, capacitors, electric motors and generators. When visible degradation becomes apparent it is generally too late and failure is imminent. Using our ultrasonic equipment allows us to monitor the level of discharge and detect when failure is likely to occur. This can save unnecessary cost of wasted energy, production loss and potential fire. Steam Trap Condition Monitoring Surveys Steam is an integral part of most production facilities. Even on well maintained plants approximately 20% of steam traps can be leaking. This figure increases if there is no yearly maintenance regime for steam traps. Ensuring it is optimised and working correctly is paramount to efficiency and a cost effective system. Most commercial steam systems will have steam condensate traps as part of a system. Failed traps can prove extremely costly especially if they have failed open passing steam which is literally money down the drain if no hot-well is present! A trap that has failed closed can cause a system to become dangerous by means of water hammer. This can damage parts of the system and break pipes requiring costly downtime, production loss, and repair costs. What's the cost of a trap failure? On average only 63% of steam traps on a site are actually functioning correctly, of the 37% that are not approximately 6% are blocked, 13% set up incorrectly and more importantly 18% are leaking. An average leaking steam trap will lose £865 of steam per year, this equates to over £31,000 p.a. when considering only the 18% of a trap population of only 200 traps. These figures are accurate based on a representative survey of over 22000 traps that have been currently surveyed. Regular maintenance and trap testing can cut this failure rate down to about 5 %. UK Thermography offer a comprehensive proven method to detect traps that are not operating correctly or have failed. 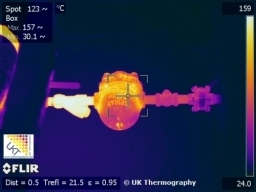 Using both Thermography and Ultrasonic monitoring devices optimised for steam systems can help identify failures within steam systems enabling you to plan maintenance and replace parts before the fault becomes serious. Our Steam Trap Surveys are comprehensive and give details of each item of equipment surveyed and its condition. This can then be included into your sites TPM or PPM schedule saving several thousand is energy loss per year. Please contact us for more information and a no obligation quote on this service. Compressed Gas & Vacuum Leak Detection Compressed Gas Loss, What is the cost to your site? The production of compressed air is expensive; a 1mm leak around a half inch pipe joint is not audible without the aid of ultrasonic leak detection equipment. To give an idea of the cost, a single air leak at 6 bars on a half inch pipe with a 1mm leak will cost between £400.00 and £600.00 per annum with electricity costs of 5p-7p per kWh. Makes you think again about those annoying hisses you hear around your site doesn't it, and they are the ones you know about! What about the ones you can't hear? Ultrasonic Air Leak Detection (USALD) is a cost effective way to locate leaks throughout your site. Most sites are losing £1000's in lost air per year. Many sites are over compensating the air supply production using high volume compressors to keep up with demand. Most of the times, following an air leakage survey, sites find the demand for air is reduced and where several compressors were being used to meet the required output, some can be placed on standby and used as backup, or even removed altogether. Many companies have compressors on hire with service contracts in place, a reduction in demand can mean you don't need as many as before and can save cost of hire and maintenance by removing surplus equipment. 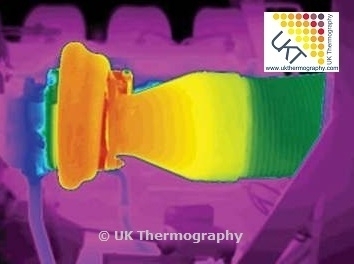 UK Thermography offer air leak detection surveys to help locate these problems. A comprehensive report and tagging system enables you to fix problems, increase production, save money and ensure equipment reliant on compressed air is optimised and failures reduced. Vacuum System Leak Detection Commonly vacuum pumps and supply lines are used as part of the production and packaging industry. Leaks on equipment and supply lines can reduce performance, efficiency and productivity, slowing down production and causing equipment failure. Ultrasonic Leak detection can be used to detect vacuum leaks and increase the reliability of equipment. This not only increases production, it also frees up maintenance teams to focus on other duties and projects increasing overall efficiency. Sealed Vessel Leakage Surveys With the aid of an Ultrasonic Transmitter, a long range module can be fitted to the ultrasonic equipment so leaks can be detected in sealed vessels and other equipment such as pipe work. The ultrasonic transmitter is placed internally and the vessel is closed as normal. The Ultrasonic Frequencies escape through tiny gaps where seals are breached which are then picked up by the receiver. The breach can then be marked and remedial action taken to ensure the seal is working correctly. These ultrasonic detecting devices are used extensively within many varied industries for finding leaks in numerous applications.